Essay: Can Independent Games be Authentic? The word authenticity, has become so integrated into the language of our everyday lives, that there is a preconceived understanding of the word, despite the concept itself being abstract and without a clear-cut definition. A rock band can be authentic. So can an expensive wine from a specific region. And so can the jeans we wear or the yogurt we eat for breakfast. These things are all wildly different in nature, and yet they all claim to be the same exact thing: Authentic. With the rise of the independent games movement, more and more independent developers strike claim to being authentic both in identity and in the games they produce. By setting themselves apart from mainstream AAA development, independent designers give the impression of being more honest and personable than larger scale productions. This essay sets out to explore the exact meaning behind two different definitions of the phrase authenticity, in order to gain an understanding of whether or not such a phrase is even applicable to digital games. First, independent games are considered as a handcrafted object. Second, independent designers are considered as authentic personalities though their relationship with their audiences. The essay concludes with a series of paradoxes found throughout the discussion of the text. Since the industrial revolution, the word authenticity has become a vague placeholder in a search for something real. The phrase itself originates from the ancient greek concept of Authentikos. This concept is described as when a person possesses both the mastery and authority over someone or something else. (Cobb, 2014) However, in postmodern society where mass-production and capitalism is the norm, it is no longer enough to simply appear authoritative to be accepted as an icon. In fact, modern society has now taken authority out of the equation all together, and has redefined the phrase completely. Now, instead of being a clear-cut concept, the word is used differently in a wide variety of contexts, in accordance to whichever product or situation it seeks to describe. Yet, an argument can be made, that if a community defines a phrase, consistently uses it, and collectively considers it sufficiently descriptive, then that phrase is as valid as any other concept, socially constructed or not. In the context of this essay, two widely different definitions of authenticity will be considered as a social construct in which social ideas can erupt from. The first definition has to do with a physically crafted object, made by one human for another. The second definition touches on the authority and the honesty of the craftsman. These two definitions will then be explored in relation to independent games and the designers who claim to fit the brand of authenticity. In a postmodern society where everything is copied and mass-produced by the thousands, a handcrafted object with it’s own little quirks and flaws becomes attractive. The human mistakes scattered over the final product – even if it comes down to the texture of physical brush strokes on a canvas, or a quirky dent in a handcrafted pot – makes the product unique and original. It is this sort of quest for the real that leads music lovers to play music from vinyls, and art lovers to make trips to galleries, even if both of these activities could be realised much easier from a computer screen. Unlike other media, games do not have an extensive past to seek back into. In video games, there is no widely accessible equivalent of a vinyl. No physical artefact to cherish, aside from old clunky hardware. Despite digital distribution of independent games being more a necessity than a wish (Lipkin, 2013), most independent games are never published in physical form. So what are game developers to do, to make up for this? In the paper High-tech Low-tech Authenticity (2014), game scholar Jesper Juul observed tendencies in visual graphics of independent games, and style-choices made by independent developers, specifically in the games who went on to win the annual US Independent Games Festival from 2000 to 2013. Either independent designers recreate games from an earlier era, in an attempt to relive the golden age of their childhood. By romanticising older retro-style games, designers revisit the graphic representation of the arcade-era. This is seen in games such as Minecraft (Mojang 2011), and Diaries of a Spaceport Janitor (Sundae Month, 2016) with their pixel-graphics and chiptunes. The other tendency Juul mentions, is a visual style that reaches outside of the world of games, in an attempt to craft a romanticised, analogue past from scratch. This is done by applying different low-tech visuals (anything from children’s drawings to things made out of yarn) to acquire a visual look displaying something handcrafted and personable. Examples of this can be seen in games such as Braid (Number None, 2008) drawing heavy inspiration from fine arts, or Fran Bow (Killmonday Games, 2015) using childish pencil-drawings and cutouts. 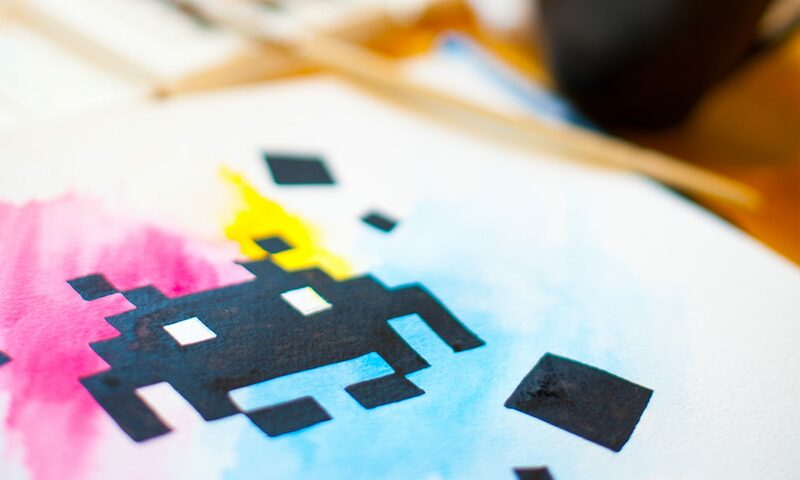 These low-tech do-it-yourself visual serves the purpose to make games look more like a handcrafted art-project, despite the incredible technical skill that has clearly gone into making them possible. Despite the games being copied endlessly in a digital format, the handcrafted visuals gives the illusion of something that has been created by one human for another. Something that is humanly flawed, and personal. Another important variation of authenticity has to do with the personal branding and image of the individual. Cobb credits this new concern with people’s honesty to the rise of social media, in which our personality has been split into many smaller fractions. What we say on Facebook or on our blog has to correspond perfectly with how we act in person, and has to be true to our values and personal belief-system. And as soon as one person backs up said blogpost, those values and morals displayed in the text will instantly reflect back on whoever supports it. In the world of independent game development, an important selling-factor of the games is that the games are being produced by a very small team, if not a single person. Because of this, it is no wonder that audiences are hyper-aware of the online presence of the designer, and demands this same consistent connection between work and belief-system. Building on top of the previously mentioned graphic design-choices of games looking older than they have to, Nadav Lipkin (2013) points out that this tendency originates in the independent developers’ very intentional desire to not be confused with the mainstream. The independent developers take on the role of spokespersons for the masses craving a throwback to an earlier era of games. In this light, the visual design decisions discussed before is not merely a choice to cover up a lack of resources, but a way for the designers to communicate their opinion of the mainstream and modern gaming to their audience. By admitting to this nostalgia and attempting to bring life back into a forgotten childhood, the designers display their intentions, and thus become honest and authentic. When looking at a low-tech visual style, executed with high-tech tools and expert knowledge, a paradox of authenticity presents itself. By consciously choosing to apply a set of visuals implying a DIY-level of skill, despite possibly being able to create something else, an argument can be made that the authentic promise becomes a constructed illusion. If the visual style of an independent game is dictated by lack of recourses or skill, then the assumed honestly of the designer remains intact. But is that still the case, if a low-tech style is deliberate, for the sake of fitting in with the indie movement? By adopting the DIY-look discussed earlier, the independent games movement assume the role of involving the audience much more. Unlike the AAA games made on massive budgets, independent designers reach out to the player and indulge them in the fantasy, that these low-tech games were made by regular people of minimal skill. Not much unlike the philosophy of the original punk movement, with bands forming in garages, this DIY-approach to games now signals that anyone who has a story to tell, or a point to get across, can pick up crayons or a pair of scissors, and be part of the independent games movement. This promise of DIY involvement is, in itself, innocent and romantic. However, if the designers limit themselves to a less advanced style in order to accommodate this illusion, does the honesty of their argument then not fall apart? On the other hand: The sheer fact that the focus is taken out of the visual style, and transferred onto the gameplay or the story instead only adds to the total honesty of what these designers are attempting to communicate. One could argue that the visual style then becomes a simple design-tool, that the independent designers can use as they see fit. Even if the visual style is designed to specifically construct an illusion of skill. In conclusion, it must be pointed out that authenticity is indeed a social construction, which can only ever be enforced and discussed by peers collectively deciding on what exactly the phrase means in a given context. Despite the visual style tendencies of the independent game movement tapping into something crafted and handmade, the final product does still not occupy a physical space, and is still mass-produced in limitless digital copies. As a result, any kind of flaw that would have occurred in a handmade product is not the slightest bit unique. Furthermore, applying a visual style depicting something handmade, for no other reason than fitting into the indie movement, is a paradox of authenticity all together. The visual design decisions made by independent designers can be seen as a tool to start a debate, especially in opposition to AAA game studios. However, is a political agenda enough reason to indulge the illusion of lesser skill? Juul, Jesper (2014) “High-teck Low-tech Authenticity: The Creation of Independent Style at the Independent Games Festival”. The Ludologist. Copenhagen, Denmark. Lipkin, Nadav (2013) “Examining Indie’s Independence: The Meaning of “Indie” Games, the Politics of Production, and Mainstream Co-optation”. Loading… The Journal of the Canadian Game Studies Association. Volume 7, Issue 11. p. 8-24. Rutgers University. All your base (2016) Diaries of a Spaceport Janitor. Accessed 30th of April. Fran Bow Wiki (2016) Fran in the Maze. Accessed 30th of April. Push Square (2009) Braid Screenshots 1. Accessed 30th of April. Killmonday Games  Fran Bow, Killmonday Games. Number None  Braid, Number None. Sundae Month  Diaries of a Spaceport Janitor, TinyBuild.